Ace filmmaker Mani Ratnam's Oh Kadhal Kanmani first look teaser 'OK Kanmani - A Glimpse' released yesterday and the makers said that the trailer will be releasing today. While the fans were eagerly waiting for the trailer today, the official OK Kanmani trailer was released in Sony Music official YouTube channel. The trailer reminds us the director's previous offering, a blockbuster movie 'Alaipayuthey' released a decade ago. OK Kanmani has the touches of Alaipayuthey, that soul soothing music of AR Rahman and ever charming cinematography of PC Sreeram. The train sequence, that old rock monumental, wedding, beach - Sakthi and Karthik come in front of you as Adhi and Thara. Dulquer will be a hearthrob to many girls post Ok Kanmani. As the bgm goes 'Kara Attakara Nan Kathirukene', the magic unfolds. Get ready for another stupendous romantic treat from the man of few words - Maniratnam. 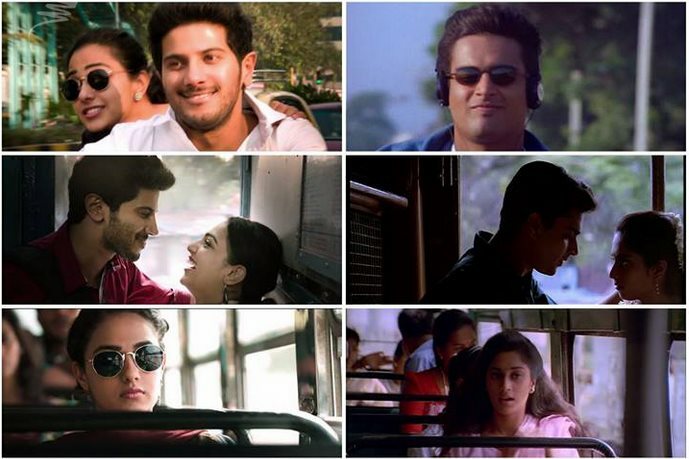 Ok Kanmani is going to be Alaipayuthey part two as we look at the trailer. We can guess that the movie is about two young couples works in corporate companies wants to enjoy their life by being friends without getting married. We can expect these couple may fall in love with each other and forms the rest of the story. Soon after the trailer release, Ok Kanmani started trending on twitter. Dulquer Salman and Nithya Menon has played the lead roles in this Tamil, Malayalam bilingual film. Ok Kanmani wrapped all the shooting schedules and team is busy with the post-production works. Produced by Madras Talkies, OK kanmani crew has Music: AR Rahman, Cinematography: PC Sreeram, Art: Sharmishta Roy, Editor: A Sreekar Prasad, Lyrics: Vairamuthu. Prakash Raj has played a key role in this Mani Ratnam directorial film. After releasing OK Kanmani first look posters on the big Valentines Day [Feb 14], makers are planning for film release on 14th April. Madras Talkies presents O Kadhal Kanmani's First Official Trailer! In theatres April 2015.